This past Saturday we got a call that my father in law was in a motorcycle accident. Needless to say, we have been gone all week and just returned home last night. The poor man broke all his ribs on the right side and his right collar bone. One of his ribs also punctured his lung. He was in ICU until Wednesday and is now starting to show improvement. Just wanted to ask for your prayers and to let you know the reason why I may not be posting very often for a while. I received the photo below from Devon who requested a "house portrait" as a present for her parents. Here they are standing in front of the house and holding their portrait in front of them. Aren't they cute!! It was a pleasure to do this painting of their lovely home. 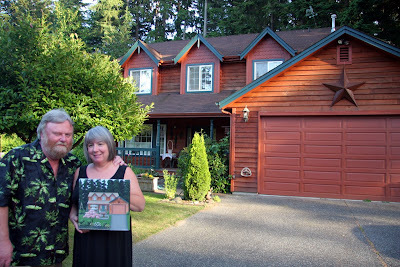 John and Vicki Bushnell live in this cozy home surrounded by beautiful flowers and tall evergreens. They are a hardworking couple, but in his spare time John is a woodworker and dabbles in photography. Vicki loves to decorate cakes and their home always has the sweet scent of frosting. When she isn't busy in the kitchen, Vicki is creating something at her sewing machine. They've always worked well together as a couple doing various remodeling projects on their beautiful home. Oh Cathie! I am so sorry to hear about your father-in-law. I will keep him and your family in my prayers. I'm sorry to hear about your father in law. I will keep him in my prayers. Your artwork is great! I love that house portrait and the house. I also hearted your shop. I'm curious to know how you started doing folk art? So sorry about the accident glad he is showing improvement. It's a must to click to enlarge this photo! Beautiful! So sorry to hear about your father in law, Cathie!! The house portrait is fabulous, as is all your work!! So sorry to hear about the accident. Happy to hear he is showing improvement though. I am also glad I found your blog. I love your style, your artwork is inspiring. I am praying for a quick and full recovery for your father in law. Hope your FIL will be OK..and what a beautiful house portrait...I bet they will cherish it always. Catherine, I'm sorry to hear about the accident. I wish your F-I-L a very speady recovery...poor man. Oh, Cathie, I'm sorry to hear about your father-in-law. I will keep you all in my prayers. What a lovely painting you did! I am always in awe of the God given ability of artists. Beautiful! I hope your father in law is getting well soon, and that you and your husband can calm down. I am so sorry to hear about your father-in-law! I hope he improves and heals quickly and will keep your family in my prayers! I hope your Father in Law continues to heal, poor guy he must be miserable. I know my Sister n Law was in a car accident 6 months ago and she too had a punctured lung and broken ribs along with other injuries so I know how what you are all going through. I will keep you in my thoughts. The house painting turned out great! and the Bushnell's look so happy. So sorry to hear about the accident. Prayers sent your way!! Cathie, I was so sorry to read of this in the comment you left for me. Hope that each passing day finds both your mother and your father-in-law recovering well from their respective injuries. I know all too well how busy this time is for you and yours. May the answers come as you need them. Believe it or not, I have found that good old-fashioned "word of mouth" seems to have worked best for us so far. If we had listened about the first "home," we never would have agreed to place my grandmother there. One last thing, take all the time you need without guilt. Oops, I lied again, two last things. The last is to remember to stroll through a garden from time to time. I won't stop praying for him. I pray for comfort for you and your family, too.